After the election night count showed that county prosecutor Lori Frugoli had a narrow lead to become Marin’s next district attorney, her opponent, Anna Pletcher, was not ready to concede the hard-fought race to her. An estimated one-fourth of Marin ballots — more than 38,000 — most arriving by mail or turned in at the polls, still need to be counted. The candidates are 2,560 votes apart. The race for D.A. is just one of many cliffhangers from Tuesday night’s count. The outcomes of school board races in Kentfield, Novato, Sausalito-Marin City and the Tamalpais Union High School District could change. There are also nail-biters in the Marin Healthcare District board vote and in some of the local sewer district contests. And many contests likely won’t change. For instance, Marin voters, with a 74 percent majority, joined with other California voters electing Gavin Newsom, a product of Marin schools and a county resident, as the state’s next governor. In addition, Marin voters re-elected their three legislators, with Rep. Jared Huffman topping the trio with an 81.6 percent victory. Assemblyman Marc Levine and state Sen. Mike McGuire also won with comfortable leads. Marin voters also were loud and clear that they want their local transportation system fixed. They not only rejected Proposition 6, the measure to overturn the state’s gas tax, but solidly endorsed a renewal of the Transportation Authority of Marin sales tax. Measure AA, which needed a two-thirds majority, got 74.7 percent of the vote, despite vocal opposition. That’s an impressive statement of public confidence in the work that TAM has accomplished, from pushing much-needed freeway improvements forward to paying for school crossing guards. Marin voters are aware it’s going to require new revenue to pay for work that should not only make driving on our freeways less of a headache, but also fix local streets, help pay for school buses and continue improving Marin’s network of safe bike paths. West Marin voters also clearly endorsed Measure W, with 73.5 percent of voters backing the county-proposed increase in the lodging tax levied on visitors to the area’s hotels, inns and short-term rentals. Revenue from the increase will go toward building and preserving affordable housing and supporting emergency services in West Marin. Unlike a sales tax, gasoline tax or a school parcel tax, Measure W is a tax that most West Marin voters may never have to pay. Voters were voting on whether others should be taxed more. The objectives of Measure W are important and its victory was predictable. Marin voters also joined voters statewide in rejecting Proposition 10, the much-debated measure aimed at increasing the number of cities and counties imposing rent control. On election night, 59.4 percent of Marin voters opposed the measure. Statewide, it was getting drubbed, with nearly 62 percent rejecting the measure. The argument was that building more housing, not rent control, is the best solution to California’s housing crisis. Every county has to share in meeting that responsibility. Another sure-thing was the outcome of water board races, in which four incumbents faced challengers. All four incumbents — Cynthia Koehler and Jack Gibson in the Marin Municipal Water District and Rick Fraites and Jim Grossi in the North Marin Water District — were re-elected with wide margins. But their challengers, while unsuccessful in winning election, did succeed in raising many important issues, from the need for greater fire prevention work across watershed lands to improving public awareness about their agencies’ finances. Before Election Day, county Registrar of Voters Lynda Roberts predicted voter turnout could hit 75 percent. 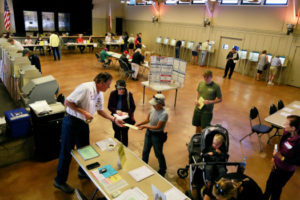 Given reports of voters having to stand in line to wait their turn to vote, despite a large number of voters choosing to vote by mail, the turnout could top that. That’s a significant increase in turnout from 60 percent in the 2014 gubernatorial election. In some races, election night results were clear. But each and every vote must be counted, and some races are still up in the air and too early to call … or concede. Pacific Sun endorses Anna Pletcher for Marin D.A. Join Anna in making Marin a safer, more just community! I agree to receive texts and/or emails from Anna Pletcher for District Attorney about ways to get involved and support the campaign. Opt out at any time. Message and data rates may apply.